One Room Tower is a small addition to the architecture of the city. A determinate form of indeterminate occupation – it is simultaneously intended as an urban artefact and utility, designed as a robust and adaptable set of ‘subspaces’ within a singular volume. The tower is a typological idea initiated in the design process via the early acknowledgement of a site within the site. 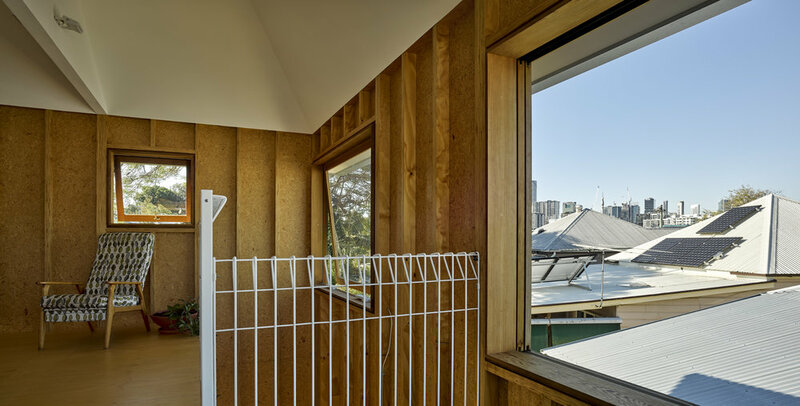 One Room Tower is also a proposition for the accretion of urban detached housing enclaves, which verge upon our Australia’s cities, such as West End in Brisbane. 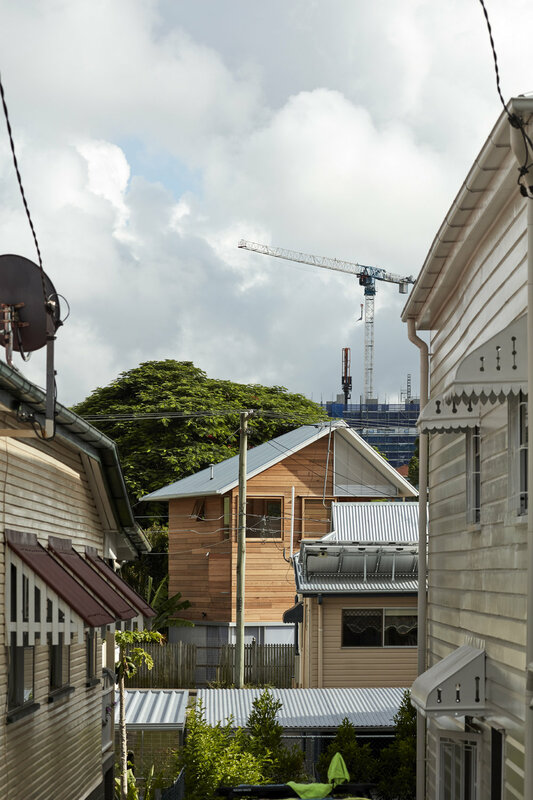 It presents a counter position to the current conventional default of raising and infilling under Queenslanders or the ponderous acts of extending character house stock. Both approaches tend to distort the existing context and relationships and the inherent architectural language of the vernacular. Alternatively, One Room Tower aims to present a model for greater density by offering genuine opportunity for diversity of occupation. We value permanence (continuity) within the urban condition. The Tower seeks to cultivate a sense of relatedness to the ‘collective memory’ of the West End Estate, rather than prioritising the specific relationship to the adjacent house. The form and elevation of the Tower respond to the prevalent local typology and fabric by the making of an affirmative architecture which displays familial characteristics. 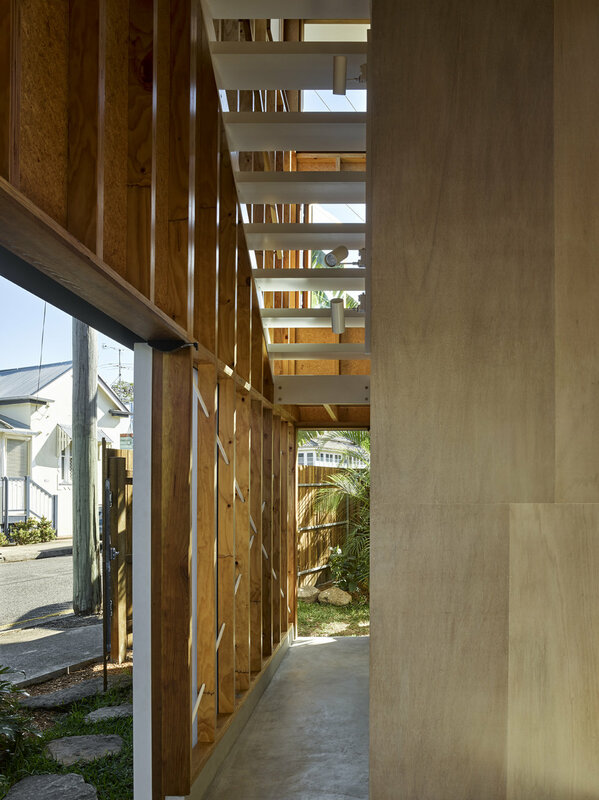 Whilst the vertical spatial ordering is in stark contrast to the horizontal planar rafts of the existing Queenslanders, the tower displays the essential ‘tripartite’ constitution of hipped roof, timber framed bodice and light understorey. 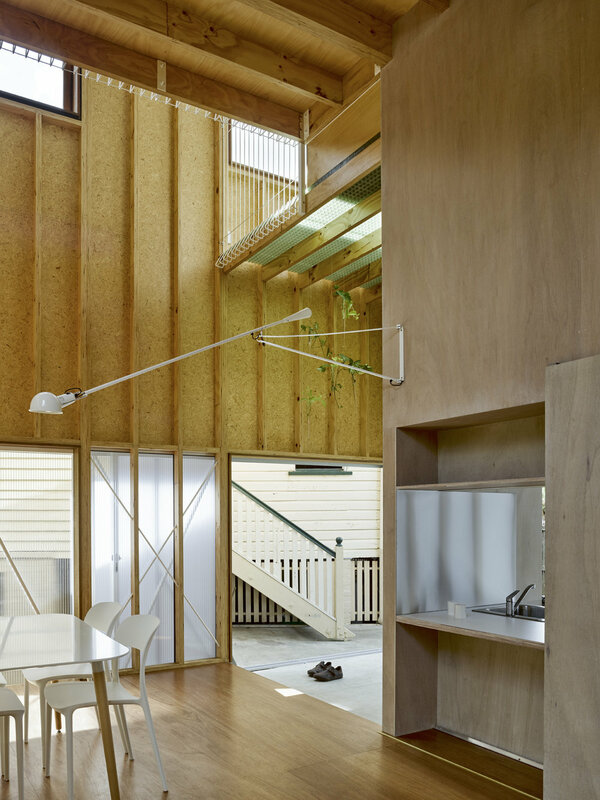 The interiors are an invention and demonstrate a spatial and structural intelligence learnt from examples in the Metabolism movement, coalesced with the raw tectonics of the Queensland vernacular. Exploring the spatial ideas of ‘core’ and ‘peripheral frame’, a sequence of prescribed subspaces is created and corralled through the specific placement of the service core in regard the square frame of the plan. A consecutive series of living platforms spiral vertically up from the grounded entry ‘doma’ up into the coffered roof space. 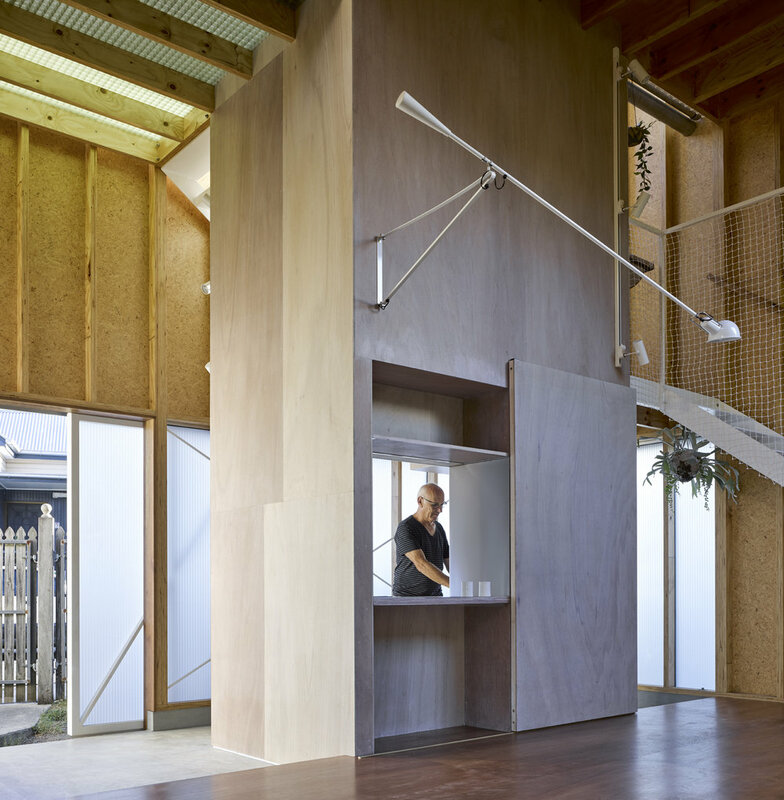 Each platform spanning between core and frame creating uniquely scaled spaces located within the one room. The counter posed narratives of exterior and interior overlap in the choreography of openings and introduction of landscape and cityscape into the room. A quartet of courtyards, created through the subtle shift in geometry of the tower away from the orthogonal street grid affords immediate connections and privacy and inflates the interior scale. 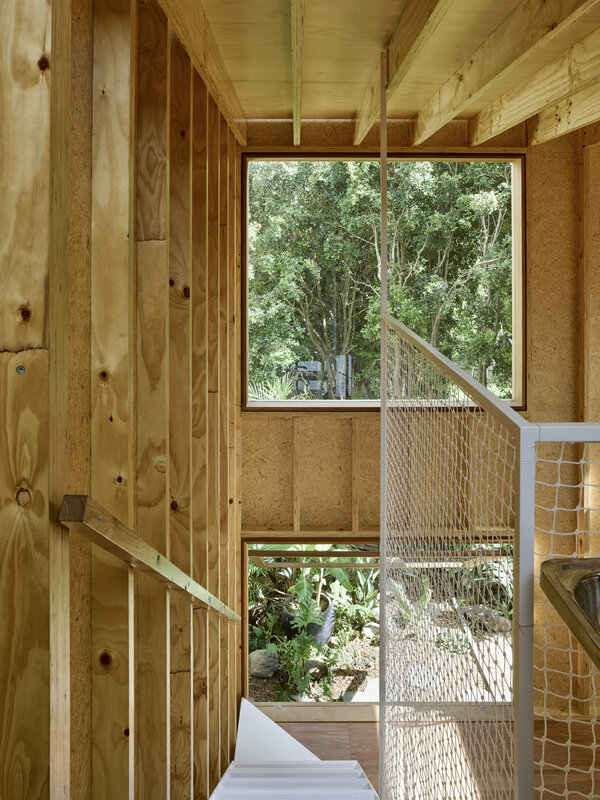 Sliding openings frame the surrounding context, which can be edited personally by the occupants. The tower is connected via a breezeway to the house while also maintaining its own side street access. The posture generated by the orientation within the street asserts its independence and autonomy. 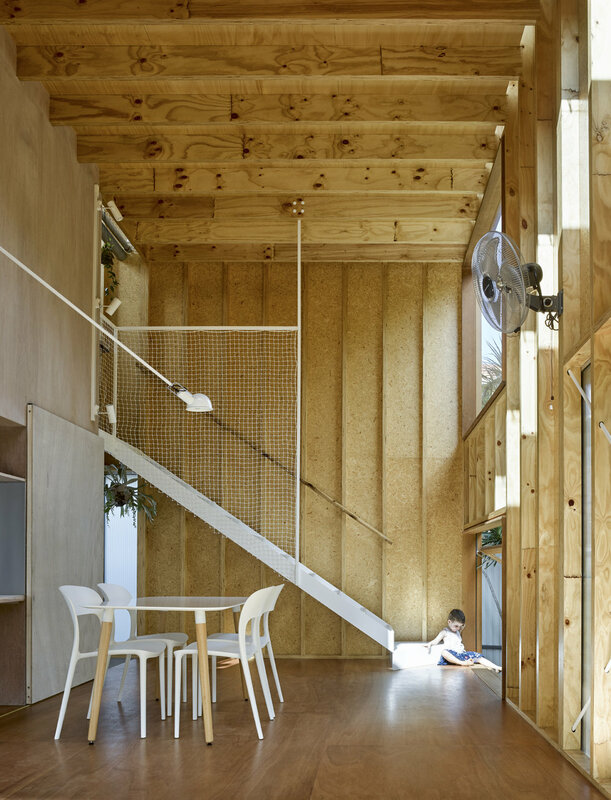 Ultimately it is designed as an adjacent ‘neighbour’, a complementary living cell rather than an extension of the existing. One Room Tower seeks to reinforce the greater pattern of built form and garden landscapes by occupying an urban void and responding to the rhythm of the sectionally exposed end sites of the urban block. 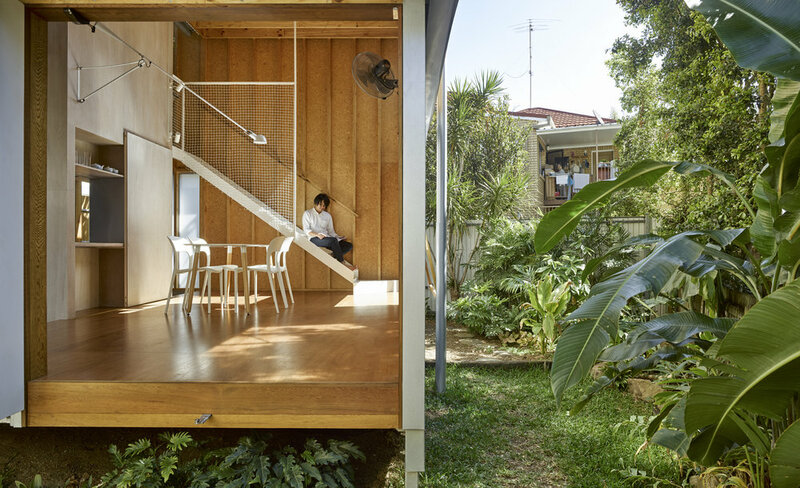 The One Room Tower is an expertly crafted stand-alone extension to an existing Queenslander, acknowledging the backyard as a ‘site within a site’. The tower contrasts the status quo of renovations where ‘rising and building under’ is the norm. 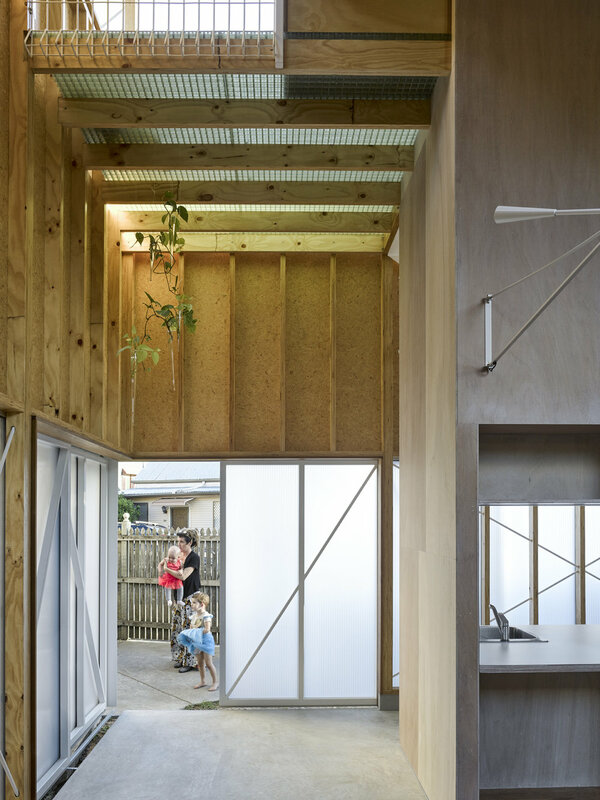 The extension stands alone as a separate structure in the backyard and allows the character of the traditional ‘timber and tin’ home at the front to be preserved. An architectural response to a corner site, the plan of the tower is subtly rotated by 15 degrees, creating triangular pockets of garden space and new views across neighbouring roofs. The internal space of the tower is intercepted by living platforms and a neatly stacked core for the wert areas. Each level is notionally connected through views and transparency as the occupant climbs the stair, creating defined spaces within ‘one room’. Exposed internally, tall single lengths of LVL disappear past the edges of the lining platforms, with junctions beautifully detailed and built. Transparent walls of varying opacities offer a changing light quality. 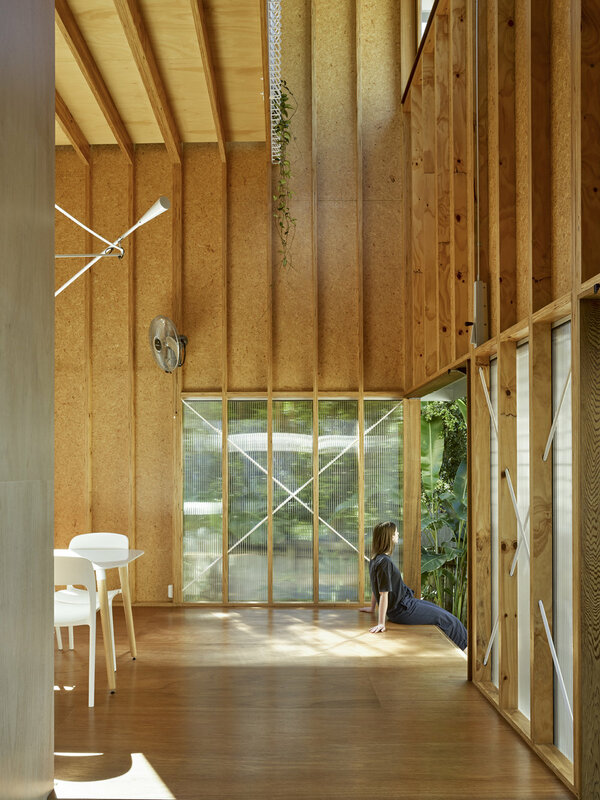 Subtle sliding doors at the ground level transform walls in to openings, connecting the interior with the garden landscape. 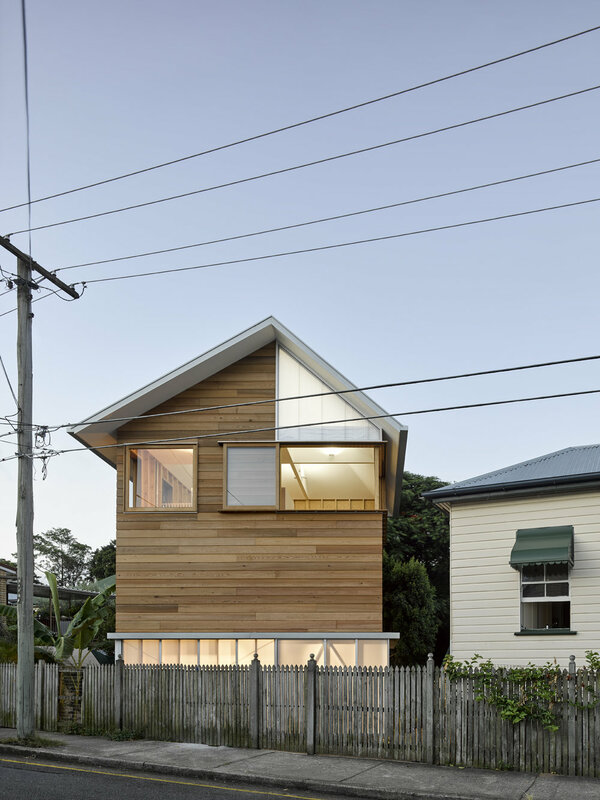 Although it stands alone, the material choices of the tower reference its context, shiplap cladding, a fence-like balustrade, and dissected hip roof. 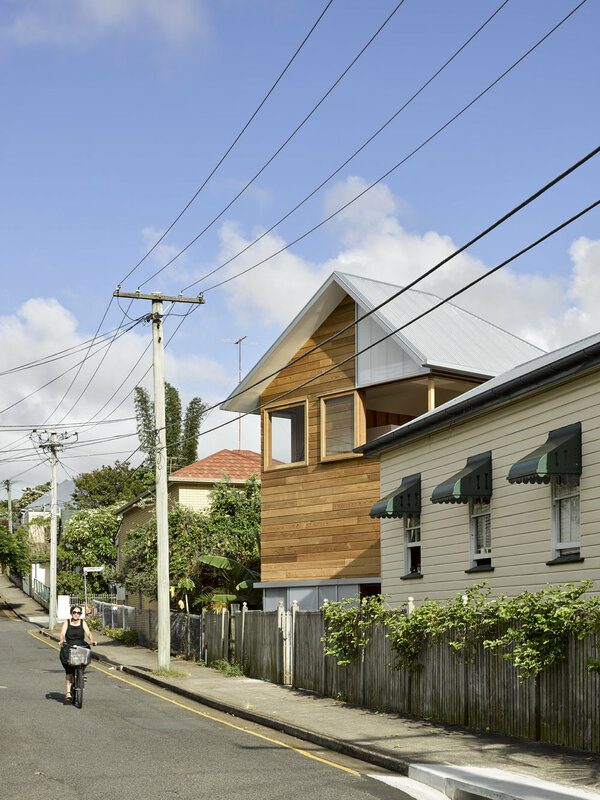 This pilot proposition is one that could be replicated across the suburb of West end as a dynamic solution to increasing density in residential areas, which simultaneously preserves Queensland vernacular. © 2016 Phorm Architecture Pty Ltd. All Rights Reserved.